Bryan Hulbert - TULSA, Okla. (February 13, 2019) The time to set your reminder is now. 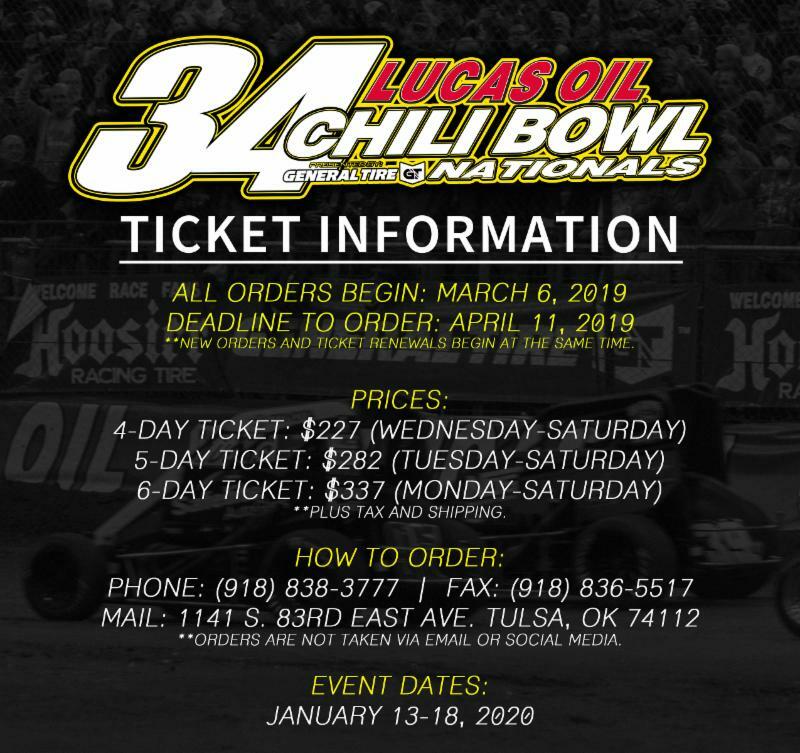 Reserved Seat ticket renewals and new ticket orders for the 34th annual Lucas Oil Chili Bowl Nationals presented by General Tire begin on Wednesday, March 6, 2019, and run through Thursday, April 11, 2019. New for 2020 ticket sales, the shipping policy has been updated. Due to a rising issue of tickets getting lost in transit, and/or stolen, domestic orders will be sent via USPS Certified Mail to ensure each order sent will require a signature. The policy of keeping all international orders in Will Call will remain unchanged. The offices of the Chili Bowl Nationals are open Monday-Friday from 9:00 A.M. to 5:00 P.M. (CT). Tickets can be renewed starting Wednesday, March 6, 2019, by phone at (918) 838-3777. Again, all new orders, as well as renewals, begin at the same time. Current ticket holders will be sent a renewal form. If ordering with the renewal form, those can be returned by mail to 1140 S. 83rd East Ave. Tulsa, OK 74112 or by fax to (918) 836-5517. Tickets can be purchased with Visa. MasterCard, Cash, Check, or Money Order. Orders will not be taken via email or social media. If a Reserved Seat ticket cannot be procured, Pit Passes will be on sale at the event and never sell out. The Pit Pass double as a General Admission pass and allows fans access to the back straightaway on a first come, first served basis. Pit Passes are $45 per weekday and $60 on Saturday. Passes can be purchased for multiple consecutive days. Pit Passes are not sold in advance. All orders are processed by hand throughout the month of May. All renewals are processed first, then changes to those accounts, then new orders will be done in the order they were received until all tickets are sold. Times and other event information will be published as the event draws closer. Lucas Oil Chili Bowl Nationals - Est. 1987 - Tulsa, Okla.